The Hess/Rice Family Page: Barbie turns 50 this year!! This year, America's favorite fashion doll is celebrating her 50th birthday (Shhh! Don't tell Ken!). The big events include her first-ever fashion show on February 14th during Mercedes-Benz Fashion Week where over 50 of the hottest designers will be creating looks from Barbie's past, present and --wait for it-- future. After that, the timeless style-setter will be gearing up for her celebrity-studded real-life, Malibu party on March 9th in a Jonathan Adler designed Dream House®. 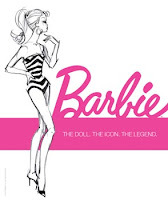 Throughout the year-long celebration, Barbie® will also be teaming up with Bloomingdale's, Stila, Colette, Facebook and many more. Read on to find out what all the BlogHers have to say about the celebration, and the fashion icon behind the buzz! WOW !!! Hard to believe the doll I played with as a child is 50 years old this year already! I remember all the fun my friend Helen and Joanne and I had, playing on a hot summer day with our dolls under the big tree in front of my house. The boys would be off playing with their dinosaurs and wishing we would go away. We had a store at the Plymouth Meeting Mall in PA. where the sold straight pins with things like a ladybug or dragonflies and the sort at the end of them. They were all the rage back then everyone would sport them on our handbags (yes I said handbags not purses) or our coats. But my favorite thing to do with them is use them for Barbie's earrings!! She looked so cute with them on. Or we used straight pins that had the silver balls on the end or the colored ones as earrings for our Barbie's. Some of them were too big and they would come out the other side of her head but we didn't care we thought she was cool looking! The Barbie's of the 50's had to much eyeliner on, bumps on their feet, this was to hold their shoes on, straw like blonde hair that if you combed it you were done because it never went back to how it was, a killer upper chest area that I guess young girls hope some day to have I wasn't lucky in that department growing up. You could buy just her clothes you did not have to buy a new Barbie for each outfit. Ken was a little strange looking with his not real hair and over sized body. I think he was much bigger then Barbie. If I am wrong some one let me know. She had a dream house, but I was never able to get it because it cost to much money and we really didn't need it we had our imaginations to help us play. If anyone has any memory they would like to share it would be really fun to hear about. Oh my goodness, I was such a Barbie person as a child. I think I must have played with mine for hours every day. I had Barbie, Skipper and Midge, but never Ken (my mom wouldn't let me get him!). I never had the dream house either, my parents would have never spent that much money on a toy. I remember that whenever I went to the doctor and got a vaccination, my "treat" was to go to Toys R Us and pick out a new Barbie outfit. And you're right - we just got new clothes, not a new type of Barbie each time. I don't even remember others being available. I remember those pins you mentioned - I know I had ladybug ones. I don't think I ever used them on my Barbie though, but they were pretty! Thanks for bringing back some great memories. Thanks for your kindness and posting our FHE button on your blog! We are having a give-away starting Friday, Feb. 27-Mar. 6. Come by, enter to win! !